On November 18, SCW President Karissa Kruse participated in a fireside chat and discussion on sustainability, wine, and sports, supporting the partnership with Super Bowl 50 Host Committee and Sonoma County Winegrowers, Vintners, & Tourism. 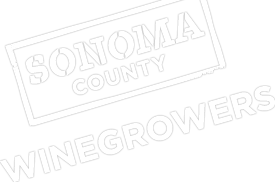 The discussion highlighted Super Bowl 50’s commitment to be the most "green" event in the history of that major sporting event and Sonoma County’s commitment to becoming the nation’s first 100% sustainable wine region. Hosted by Nick Aster of Triple Pundit, Karissa was joined by Neill Duffy, Co-Chair of the Sustainability Sub Committee & Sustainability Advisor to the Super Bowl 50 Host Committee. Karissa also shared several sustainably-grown and produced wines from Sonoma County, including Balletto Vineyards, St. Francis Winery & Vineyards, and Davis Bynum.